A few months ago I received a mail from Barry I. Cameron, professor in geology and volcanology at the university of Milwaukee, regarding his interest in setting up a project on the different terroirs on mount Etna. As prof. Cameron is on a sabbatical journey in Italy, this was a great opportunity to visiting the Etna and it’s different terroirs. As this is a project of a certain importance, I contacted Andrea Franchetti and Alberto Aiello to join in on this first meeting in order to have a broader selection of plots which we could analyze, without getting too widespread either for an initial start. 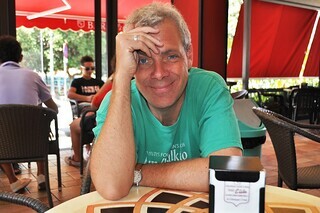 For this specific project, Barry contacted specialist Marco Neri of the Geofysical and Volcanological Institute of Catania to join (www.ct.ingv.it). Marco has an incredible knowledge of the geological history of Etna and the vineyard tour together was for me a real enrichment. I enjoyed our first day greatly and Marco will surely be an added value to this project. The next day, after the tour of all the different vineyards the day before, Barry and I started sampling the soil of all the different plots for initial analyzing. After this first approach, Barry will analyze the soils with different scientifical methods, in surface but also in depth. 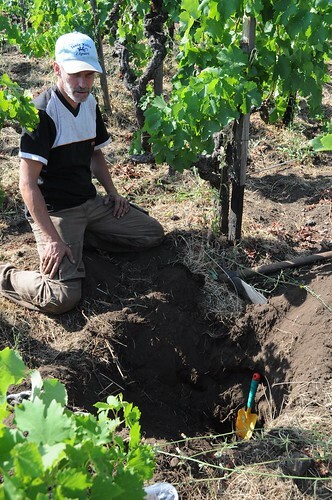 Marco will add all the historical lava information as well as the scientifical climatic maps of every single vineyard. This project will obviously be time consuming but might possibly add to the understanding of our different single vineyards in terms of expression, combined to vintage conditions. I strongly believe in the marriage of science and intuition, and through the sensorial expression which is the wine of this vineyard, we could possibly understand better the differences of the cru’s of the northern valley of Etna. And as we are only at the start of the evolution and knowledge of the northern valley wines of Etna, this information can be of great use to understand better our territory. It is raining ash! Etna is active. This entry was posted on Wednesday, August 15th, 2012 at 3:49 pm	and is filed under Impressions & Experiences, Work in Progress. You can follow any responses to this entry through the RSS 2.0 feed. Both comments and pings are currently closed.